BOOTIE LA @ LOS GLOBOS – Dance Battle: R.A.I.D. vs. YOU! 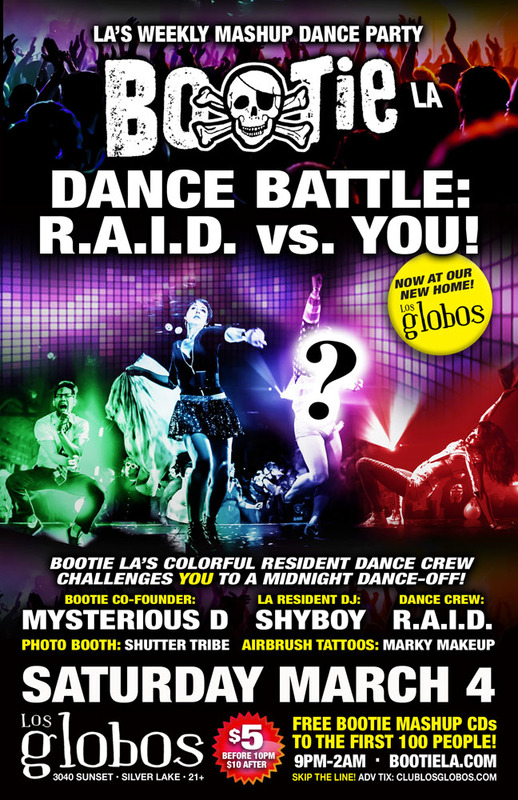 Los Angeles BOOTIE LA @ LOS GLOBOS – Dance Battle: R.A.I.D. vs. YOU! Bootie LA’s resident dance crew R.A.I.D. (Random Acts of Irreverent Dance) challenges YOU to a midnight dance-off! Practice your moves and bring your dancin’ shoes – it’s time to show off what you can do! Only $5 before 10 PM! DANCE BATTLE: R.A.I.D. vs. YOU! Bootie LA’s colorful dance crew challenges YOU to a midnight dance-off! This week, Bootie LA’s colorful resident dance crew, R.A.I.D., challenges you — all of you– to join in their Random Acts of Irreverent Dance, and battle them in a fabulous midnight dance-off! Who’s got the moves to own the floor, and the fearlessness to impress the crowd? Who can keep the party going and the insanity flowing? There’s only one way to find out — take the challenge! Bootie co-creator Mysterious D comes down from SF to join resident DJ ShyBoy, as they spin the mashups that will make you groove while you show your moves! Plus, Marky Makeup gives you airbrush tattoos, and Shutter Tribe will be there to capture it all! All this, plus free Bootie mashup CDs for the first 100 people through the door!